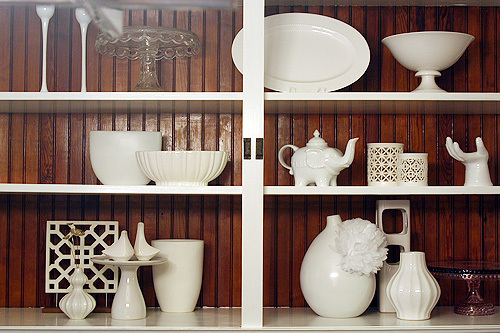 I’ve shown you how I’ve rearranged my dining room hutch full of white ceramics before, but I hadn’t ever shown my process. So here’s how I do it… I start with the big items first. You can’t shoehorn them in at the end anyway, and if you start with a pleasing arrangement the rest will fall into place. Obviously I have such a hodgepodge of items that a symmetrical layout isn’t an option for me (though I do love symmetry). I work around that by making sure that the overall layout is visually balanced. For example, see that open lattice-work square in the bottom left? That gets balanced out by the votive holders on the right middle shelf and the scallops of the vintage cake stand on the top left. I add all the little bits and bobbins that I love at the end. Admittedly they can make the arrangement a little cluttered, so I do edit them down some. Not all of my pieces made it back in, but I tend to rearrange things often so they’ll be back next time. I love having the built-in hutch to display everything. I wasn’t so sure about it when we moved in, but I’ve since embraced it. I’m still undecided about the beadboard (paint it or leave it natural? ), but I’m going to live with it for a while before I choose. It ties in the wood floors and our wood dining set, and the contrast is nice with all of the white. I’ve pinned fabric to the back many times before, so that’s always an option as well. Besides, closing the doors gives the whole thing a bit more polish. Doesn’t everything always look better behind glass? I love this!! Any tips with a built in CORNER cabinet? I really need help with mine! I love the all white collection, with the wood background! The same principles would apply, but you may want to group taller items toward the center. Or if you have three shelves, something tall in the middle on the top and bottom shelves, and then taller items on the left and right of the middle. Looks so good! I think the bead board looks great without the paint and really showcasing all your white collectables. Plus, I love the contrast of the white trim (great job, by the way!!) and the dark wood. Very nice. I’m sure it feels wonderful to be done with that project! Painting just doesn’t go as fast as it used to once you get the “helpers”, right?! Oh, definitely. I feel like this project has taken forever! I always want to ask you this but never had- where did you get those silver eat & drink letters? They are just what I am looking for! And what about that awesome white vase with the little flower on it?! Too cute! Everyone always asks about those letters! They were a gift from my mother in law, and she picked them up in some little shop in Des Moines. They’re great! Are they individual letters, or the actual words? This turned out great! 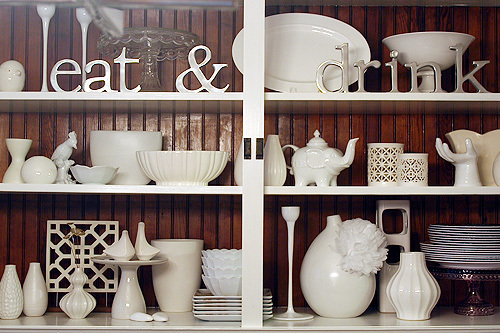 I love the how the white collection ties in with the nice white shelves now!! I was going to ask about the vase with the flower on it too. What a cute idea! Love the contrast against the wood. How about pinning a solid color fabric back there? So it’s like painting but no commitment or damage to the wood. I can totally see a bright pink back there. definitely do NOT paint it.. with all your white stuff it just wouldn’t look right. I really like the beadboard as is…it looks so nice against the white. I agree with a previous poster…a fabric or even pretty vintage wallpaper would be cool and it wouldn’t be permanent so you could switch it up as you felt like it. Okay, I’m changing my vote. Before I said to paint the beadboard, but now that I see it with the doors closed I’m all for you leaving it as is. It looks great. Also, thanks for the guide to arranging stuff. Very helpful. Looks great and thanks for sharing your process. I vote for keeping the wood natural for contrast or some pretty patterned paper or fabric in the back. I say paint the wood, but not white. I also like the idea of adding fabric or a beautiful paper to the back so you don’t have to commit to a color. Love the hutch! Looks fab! 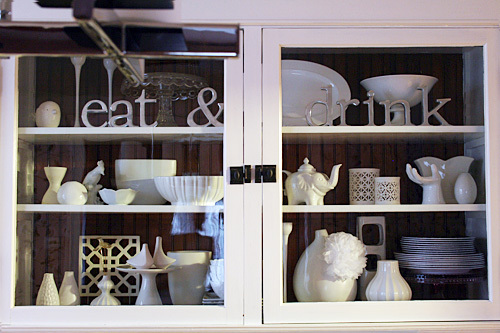 I think rearranging a built-in or hutch can be one of the trickiest decorating things to do. I have a huge built-in in my dining room and this past spring, I got brave and painted it turquoise but I am always messing with it. Your hutch looks beautiful. Arranging shelves can be maddening. Just when I think I’ve got it perfect, I walk by it and start moving things again. You’ve done an awesome job though! I like the natural beadboard, but what about a grey color? Like a Martha grey… More Greige-y as opposed to a ‘thunder cloud’ grey. Oh… and more baby bump pics! this is LOVELY! i’m a follower now and i can’t wait to read more! Delurking to say that I LOVE THIS! I have a collection of white objects too and even though we live in an apartment with little to no room for storage, I’m itching to display them! This looks great! Now that you mention tacking fabric up to the beadboard, I’m really loving that idea! This looks great! I’d love to see a photo of the whole dining room to see it in context, especially with that awesome wallpaper. 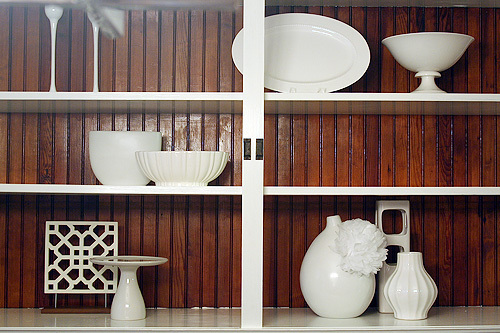 If you paint the bead board, you will have to find a new location for your lovely white collection. It just won’t look the same against a while background. Looks great! Can we see a shot of the whole dining room now? Hi, love your works. where did u get the Eat & drink display? I am glad you answered the question about the vase that has the cute corsage. Love that idea. Thanks for sharing this process, Nicole, and I second the vote for photos of the whole space. Thanks! That open lattice work piece is awesome! Thanks for this! I have a hard time buying the smaller decor items (pictures, furniture, lamps – big stuff – are easier for me) because I have such a hard time figuring out where they would go and how to arrange them. I’ve bookmarked this for future inspiration; thank you! I’m struggling lately with sadness over having to sell the home I shared with my husband. One thing that helps me look positively to the future is having ideas like this to plan new home decorating! Looks great!Like that you didn’t paint the bead board, the white really pops against the wood color. I love collections especially all in the same color like your white ceramics. Great tip on putting the large things in first! I absolutely love this! You’ve done a fantastic job! Where did you get the Elephant? Is that Jonathan Adler? I think those shakers are right? Love it! The salt & pepper shakers are Jonathan Adler, but the elephant is a $10 teapot from Cost Plus!